The "Holiday Gift Guide Kick Off" event is a fee based event. Cost is $10 for the first link. There are also additional link and sponsor options available below. promote this event sign up. This event is a great way to get a huge amount of attention for your site. If you choose to post/promote that is a wonderful way to get more interest, more prizes and help make it a bigger success. Promotion during the event is suggested but not required. However it does gain much more views, sign ups and attention for your site and is a great way to give back to the host, cohosts and participating bloggers and businesses. Current Prize Value: $600+ !!! *have some prizes you'd like to add? 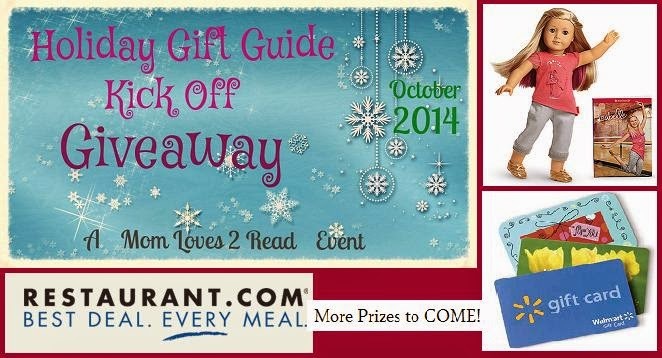 SUPER - email Susan @ MomLoves2Read@gmail.com with your prize information and value! The more the merrier! Referral Prize may be added for *blogger or individual* who refers the most new sign ups (no business websites are eligible for referral prizes) There are additional link and sponsor options available for discounted costs - all moneys paid for this event will go into additional prizes - Participants are welcome to enter but are only eligible to win sponsored prizes not covered by paid links.